The LE software isn’t bad at all. It has a really simple, clean interface that should be friendly to computer DJ newcomers, EQ, headphone cueing, and some effects (though not the full array of effects in the complete torq package), plus support for recording and playback of MP3, AIFF, WAV, WMA, Apple Lossless, and AAC. I got to play with it a little last night at the DigitalLife press event in Manhattan, and it was a lot of fun. It’s simple enough to buy for your aspiring-DJ nephew or niece for the holidays, but the hardware is still good enough that more serious users might buy one for themselves — especially at this price, if you’re on a budget. Now, the curious part: there are two products here with two different names that, aside from software bundle, are exactly the same. 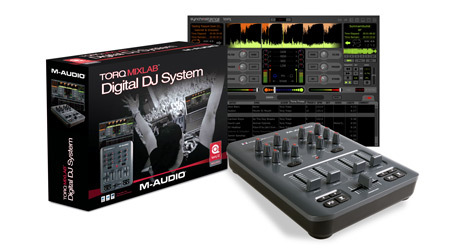 For “pros”, we have the “X-Session Pro”, whereas for “consumers”, we have the “Torq MixLab.” They both have the same price (around $100 street), but the only actual difference is that the “consumer” edition comes with software and the “pro” doesn’t — otherwise, it’s the same package, and the same hardware. Then again, if you’re liable to throw out the software disc and don’t need it to use as a coaster or to complete your Giant Wall of CDs sculpture, I guess the pro version makes sense.